This Oneness Practitioner Stole is the smallest of our line of ceremonial stoles and measures 4 inches wide and 27 inches from the nape of the neck to each end. It is made of the same antique brocade fabric used in our larger stoles and differs only in that it has no fringe. 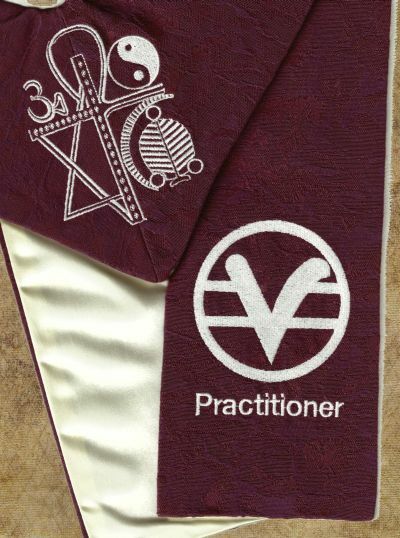 The Oneness Symbol is embroidered on the nape of the neck with the Science of Mind symbol and the word "Practitioner" embroidered on the right side front. You have your choice of numerous fabric and embroidery color combinations. For a chart of fabric color options, Click Here.